The people in your Mailchimp audience are known as contacts. Each contact has one email address, which is organized based on how they interact with your marketing. In this article, you’ll learn more about the types of contacts in your audience and where to view them. To view the different types of contacts in your audience, you’ll use the Email Marketing Column. 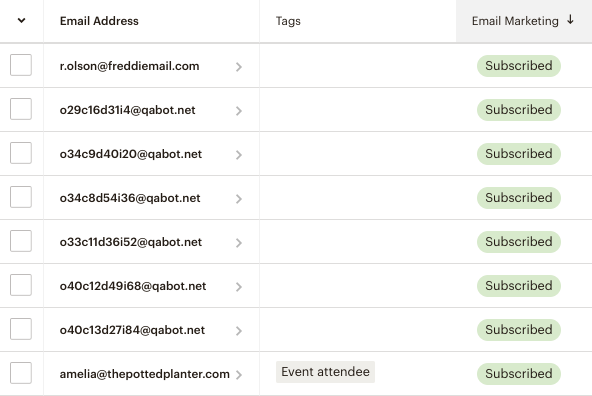 Locate the Email Marketing column of the contact table. This column displays badges to indicate each contact's type. Click the arrow to sort your audience by contact type. There are four possible types of contacts in your audience: subscribed, unsubscribed, cleaned, and non-subscribed. Contacts are categorized based on the type of email marketing or ads they’re eligible to receive. Certain contact types, like subscribers, are eligible to receive any kind of Mailchimp campaign. Other types, like unsubscribed contacts, have a few restrictions. Here are the different contact types in your audience, with a summary of what they can receive from you. A subscribed contact, or subscriber, is someone who has opted in to receive your email marketing. Subscribers can be imported directly to your audience, or they can join your audience from one of your signup forms or a landing page. They’ll have a Subscribed badge in the Email Marketing column of the contact table. This type of contact is eligible to receive any type of Mailchimp campaign, including emails, ads, and postcards. An unsubscribed contact is someone who used to receive your email marketing but has opted out. They’ll have an Unsubscribed badge in the Email Marketing column of the contact table. This type of contact is not eligible to receive email marketing, but you can still share ads and transactional emails like abandoned cart and order notifications. A non-subscribed contact is someone who has interacted with your online store, but hasn’t opted in to receive email marketing campaigns. These contacts are synced from your connected e-commerce store. They won’t have a badge in the Email Marketing column of the contact table. This type of contact is eligible to receive transactional emails about their activity in your online store, like abandoned cart and order notifications, or ads. Hard bounces and repeated soft bounces become cleaned contacts. A cleaned contact has a non-deliverable email address, which might be misspelled or invalid. They’ll have a Cleaned badge in the Email Marketing column of the contact table. This type of contact isn’t eligible to receive any campaigns. Learn how we come up with contact ratings for subscribers in your lists. Subscriber engagement is a key part of your email marketing program. Learn how to increase positive engagement, and decrease negative engagement. Learn how to remove subscribers from groups, by using bulk actions or individually.